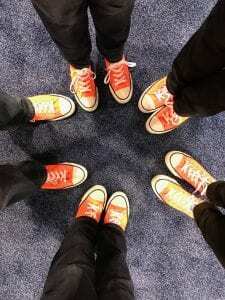 I can not say enough about my first experience at ISTE. 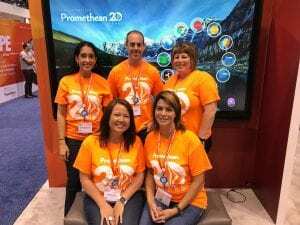 The group of educators and everyone at Promethean created an experience that I needed after 19 years in the classroom. I was so privileged to be part of the Promethean Teacher Dream Team! I was so nervous at the beginning of this journey, and after the first hour I don’t know why I felt that way! Promethean and the other teachers made me feel right at home and like I had known them for my entire teaching career. As teachers, we came from all over the country. Our schools were all so different, yet so much alike. Our major bond was how we all use Promethean products to enhance our lessons and engage our students! Promethean helps us with all of the 4 C’s of Technology: Communication, Collaboration, Critical Thinking, and Creativity. I was star-struck to meet and work with many of the Professional Development Team members after watching them over the years. I was even more star-struck after meeting Emma – the voice behind the ClassFlow YouTube videos! The videos that Promethean puts out there for FREE professional development are amazing! Sharing what I know is what I do. I will never change that! I have presented at the local level numerous times. I have hosted a ClassFlow “House Party” a few times. Somehow presenting at a national level brought everything I have done in the past to a whole new level. I am reenergized to continue doing what I love to do. I am going to host Camp Promethean for my district on July 19 that focuses on professional development for teachers. I want teachers to learn how to use their Promethean products above and beyond the basics. I want them to be excited about returning to a new school year with “new tools” that they didn’t even know they had sitting in their classroom. Be sure to sign up for Camp Promethean before July 19th and join in on the fun!!! It’s FREE!! You can sit at home in your PJ’s and learn many new things! Author: Krista Cartwright is a 4th grade teacher at Marrs Elementary in Mt. Vernon, Indiana. She has taught 4th and 5th grades over the past 19 years and loves teaching Math and Social Studies. She has a slight book addiction…some say her classroom library is as big as her school library.